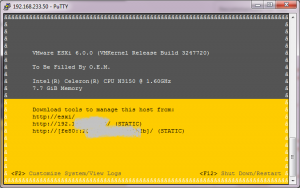 Use this method to carry out an ESXi installation in a few minutes. I’m showing here, how to modify an ESXi ISO file, so that the installation runs completely automatically from USB. This can be used in principle on all systems, of course also on the above described or on „headless systems“ without connecting a display. You’ll need a server with more than 4 GB RAM, at least two cores, SSD/harddisk and an empty USB stick (>=8GB). CAUTION: DATA WILL BE OVERWRITTEN on USB stick and on your server. So use this procedure at your own risk! Than create a bootable USB stick (size >= 8GB), for example use portable Rufus for this task. 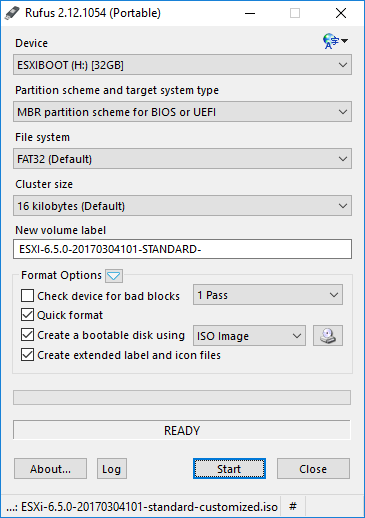 Insert an empty USB stick, use the above parameters and select your ESXi ISO image, than click on Start button to create a bootable USB installation. Download boot.cfg and ks-nowipe.cfg from my blog and copy (replace) them on the USB stick. These are the kickstart files. –> BIOS needs to be setup in legacy boot / compatibility mode (not UEFI). You will find the ip address inside your router’s DHCP status table. The managing user is „root“, the initial password can be set in the ks-nowipe.cfg installation file. My kickstart files enable ESXi shell and ssh. This are useful management tools, but if don’t need them, switch them off using the management client. If the „direct console (DCU)“ is not working on your server due to missing video output or because you use the server „headless“, is can be accessed via SSH (if you leave it enabled). Hello Antonio, will this iso also work on the Qotom-Q190G4N, J1900 with 4 eth ports and ssd? Hard to say, I don’t have such a system. I think a scripted install would work, but I don’t know if my ISO has included all needed drivers. I found out that your Qotom uses an Intel quad ethernet card (i guest you’ll need driver net-igb). Give it a try and pls post your results here. I’ve been trying for a while to get Esxi 6.5 installed with custom images, scripted install, etc without luck. It seems there’s a problem it’s trying to tell me about but without video mode or a serial port, I’m at a loss. Ryan, did you use my latest ISO file here? Antonio, I tried the image again and it runs, but hangs at „Relocating modules and starting up the kernel.“ I tried adding your scripted install but it doesn’t seem to work. Thanks for your help. … ok, this is normal on these boards. Due to incompatible graphics the display is switched after „relocating modules“. –> So this was the real trick: not the first ethernet port of the Qotom device is activated after an ESXi install, but the SECOND ethernet port is. I bought a cheap mSATA to USB enclosure from Amazon, put the card from my J1900 into it and connected it to my laptop. I then used your VMPlayer idea to pass through the mSATA to the VM as a physical disk and installed ESXi. I then moved the disk back into the J1900 and booted it successfully. Unfortunately your 6.5 image you posted earlier didn’t recognize the network ports on my J1900, but I used one of your 6.0 images from a different post and it worked flawlessly. It showed up on the second Ethernet port as you listed as well. If you want, I could provide a DD style image of my disk that someone could use a Linux Live CD to apply to their disk while it’s in their computer and save them the trouble of the adapter. Thanks again for your help! Now to try getting it to 6.5. Thank your for your feedback. Fine, that your system is up and running. Good idea to provide a DD image. Please post a link here. thanks for your nice guide, I will try to on my Asrock Q1900-ITX as soon as I can, I would ask you if I can install esxi directly ON usb drive instead of the first hard drive. just remove or disconnect your harddisk for installation, so it is impossible to overwrite data. Thanks Antonio for your reply, I tried as u said disconnecting the HDs but it remain on Relocating Modules and starting up the kernel. I will try the other solution with vmware player. Thank for your great job!! Hi Antonio, your guide has been invaluable. I have installed your ESXi-6.0.0-20160804001-standard-customized.iso file on my QOTOM J1900 using another box – an HP N36L – to install as the graphics are supported. I then transferred the mSATA disk to the QOTOM and it works. Thanks for the guide. Now to see if I can upgrade to ESXi 6.5 without destroying it! I wish you all the best for the upgrade. Thanks for the tutorial, I managed to install ESXi 6.5 this way on the J3160dc-ITX. However, the hardware sensors are not working currently. If I go to the host / monitor it says: No sensor data available. Do you also have this problem, or do you know how to fix this? I have the same problem – no sensor data available. 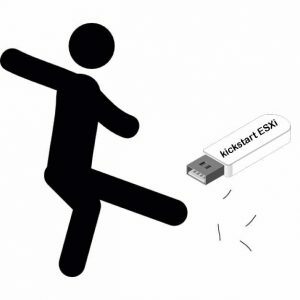 I’m just wondering, if this kickstart method or any other one is working a ZBox CI320 with an Intel Celeron N2930? Thanks for this! I managed to spin up on a Asrock Q1900-ITX and have migrated a few VM’s from hyper-v. Is there a way to update esxi to the current version? I tried using“esxcli software profile install…“ but it wants to remove the drivers needed for this to work. Sorry if I missed something about this and thanks again for your 6.5 image and config files! Which image did you use for your Asrock Q1900-ITX install? Antonio’s customized one works? Replace Name of … with the correct datastore and file name. Configuration will be saved due to ‚update‘ option. Use at own risk, make backups before patching and read notes at http://www.vmware.com ! Note: In my system I had installed ghettoVCB and some additional NIC and SATA drivers in my custom image, so I have to use the -f flag (force). I fixed it by first installing the locker vib manually! Thank you so much for this and such a quick reply! My first attempt was actually using a few of the links you mention, but I think I didn’t do things properly. Now I know I was on the right track. Hopefully I can try this out this weekend, but not before I take a few more backups/images. Cheers! Fine, that you managed to get to Update 1. As I’ve written on 2018/02/03 in this post, there is actually an error with locker vib, which writes out ’no space left on device‘ erroneously. big thanks for this work. But i have a small question. I use a 500GB normal hhd for my esxi. But i only get write performance with 15MB/s. Used the neweset esxi version. I disabled the vmx sata driver, use the sata_xhci driver. Ok, there are some incompatilities with ESXi 6.5 and some SATA hardware. but disable this driver didn´t help me. Performance on vmfs is realy realy poor. Is it possible to create a new driver for N3150 ? The network drivers are necessary, because N3150 / J3160 have unsupported realtek NICs. As for the hard drive driver, I’m not sure if it is still necessary to replace it in version 6.5. I could generate a new image without replacing the SATA driver. Please enter this command via SSH (putty) on the ESXi and post the result (only SATA driver version). The performance on nativ sata and sata normal driver ins unbeliveable poor! Maybe it is faster on esxi version 5.5 ?? I try your solution on my asrock beebox N3150 but unfortunately it doesn’t work. I also try all of your other solutions (internet setup …). When installing ESXi it still on „Relocating modules“ but it never restart the beebox. I try to restart it manually after 30minutes or one hour but ESXi is never installed (I try legacy mode and UEFI mode but same issue). Use option 4 and first install your ESXI inside a VMWare player on USB stick. Than boot from this stick as described in the above post. Be aware to download my latest ESXI 6.5 image. The IPXE installation over internet is outdated, I have to update and test the installation files with ESXi 6.5, latest update – when I have some time to spend for it. I will try it (this is the only option I haven’t test yet because I would not be obliged to boot from USB but I will try). Just to be sute. Your latest 6.5 is the file mention on this current page ? There is a „Download files link box“ with all download links. Please post some details about your system. Are you using a „normal“ SATA drive or is this a M2 ? A friend had problems with direct installation on M2 drive, but option 4 using VMWare player worked well. It is not a problem booting with an USB stick, a system needs to be restarted only once or twice per year. I finally by a server to install esxi because even with your tutorial I was unable to install it (I try all solutions).